In a natural disaster like typhoon, structures including churches and temples are not spared from the impact of the plague. The effect of gusty winds and heavy rains may cause tiled floors to be severely damaged not only with the volumes of water but also with the mud flood. I once had the chance to be a volunteer of a non-government organization offering stress-debriefing sessions to calamity victims. I walked around a devastated town and got a chance to be shown around the affected important structures in the area. I have seen few old churches devastated by super typhoons where the insides were seen as huge mess. There was mud everywhere. Carpeting and furniture were destroyed and pews fell apart. It was devastating to walk in there and see the interiors of a parish church that look like it was beyond hope and repair. That flood that got the area was a more severe case of deeper flood, so much so that it damaged the important systems like duct, sewage system and the foundation. 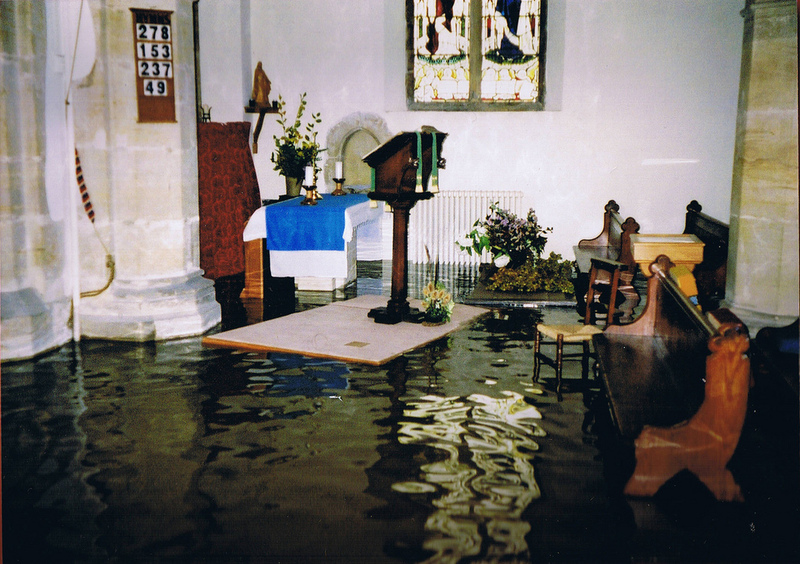 There was one church where part of the aisle’s tiled floors had broken up and the flood transformed the whole church into a swimming pool with the pews underwater. Through the resilience and ingenuity of spirits of all the parish staff and community volunteers, the churches were cleaned up and restored. These were the people whose own homes were also wrecked by the typhoon. But they were seen in churches rolling up their sleeves and shoveling the mud instead of being consumed with their own woes. I believe they have survived many storms that enabled them to be skilled enough in putting a church back in shape. I have observed that they seem to really know the right thing to do. After a flood, water damage restoration and clean up can be a long and hard process. Water pump generators were operated around the clock in order to pump out all the water in the church. Garden sprayers or hoses were used to wash away mud from the tiled floors. Flood waters contain many contaminants. Sanitizing in the right way was properly observed. The floors are cleaned and disinfected in every surface. They scrubbed surfaces with hot water and a heavy-duty cleaner and then disinfected with chlorine solution or disinfectant product. Of course, they were not able to do it alone. Despite the help of the community and us volunteers, the people still needed professional hands in making sure that the churches were repaired from the damages. It is worth noting that the service team they hired came in as volunteers, donating their services to the churches that were devastated by the flood. People in the community had taken much pride in rich heritage which is why they really took the effort to restore their hundred old churches.